"We’re already seeing benefits for clients due to the advancements of this technology." The Raymond Virtual Reality (VR) Simulator is a finalist for the 2019 International Intralogistics and Forklift Truck of the Year (IFOY) awards. Specifically the Raymond VR Simulator was nominated in the Special of the Year Category which recognizes technology that significantly improves warehouse environments and/or the physical or psychological conditions of the user. Ergonomic innovations, safety assistant solutions, automation solutions, drive technology, and forklift attachments are specifically emphasized. The Raymond Virtual Reality Simulator plugs into a Raymond forklift truck via the patent-pending sPort, or Simulation Port. At any time the sPort can be disconnected, and the forklift can go back to regular operation in the warehouse. The benefits for this product are ranging. 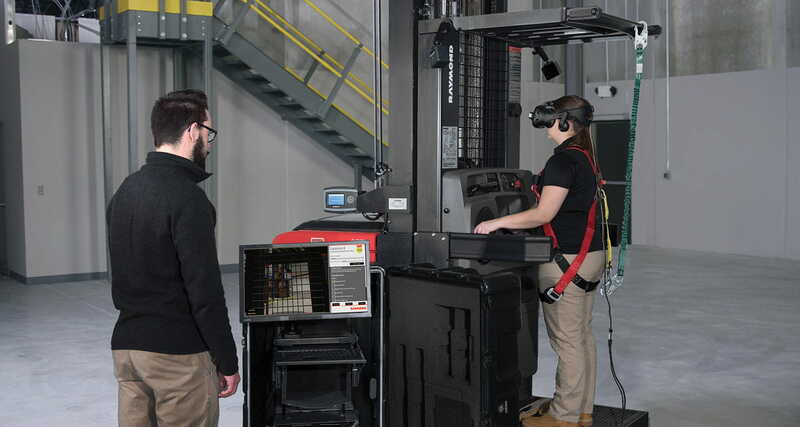 Users in training can undergo experiential learning in multiple scenarios, and the product further provides the ability to prescreen incoming forklift operator applicants. Under an experienced instructor’s guidance, the virtual reality lessons increase in complexity, building on principles learned in earlier modules. This affords operators the ability to feel comfortable with the forklift prior to reaching the warehouse floor. Winners of IFOY will be announced April 26, 2019, at an award ceremony at the Hofburg in Vienna, Austria.